Make a style statement dressed in this fabulous JAQURD Silk Brocade Fabric Cream indowestern. All patterns are intricately Embroidered Work. 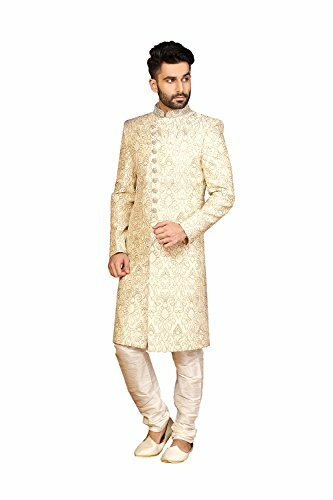 Additional Information 2 : As This Sherwani/Waiste Coat/Kurta Are Made As Per Orders So It Is Strictly Not Acceptable Once Get Delivered .So Kindly Choose Body Fit Size . Also We Keep 2 Inches Extra Margin In The Dress. If you have any questions about this product by PinkCityCreations, contact us by completing and submitting the form below. If you are looking for a specif part number, please include it with your message.